The Rebel Sweetheart. 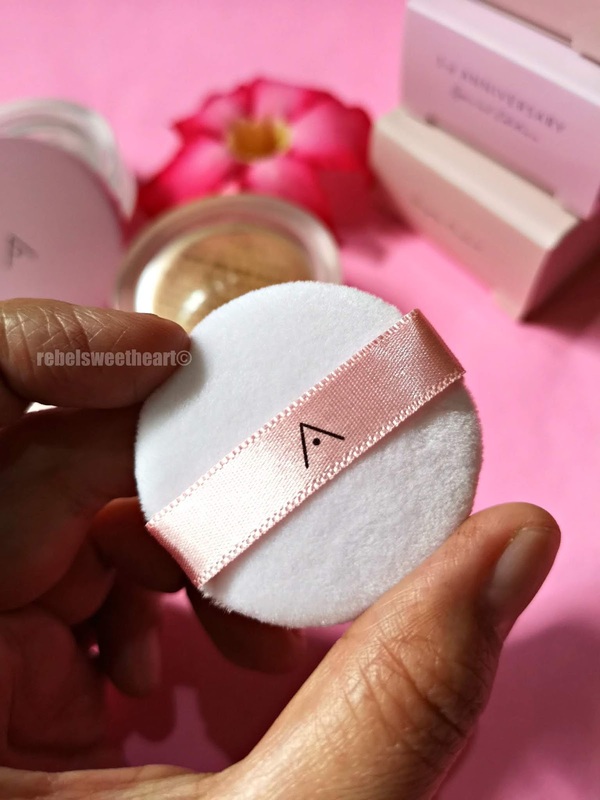 : Spotlight | Althea Petal Velvet Powder. 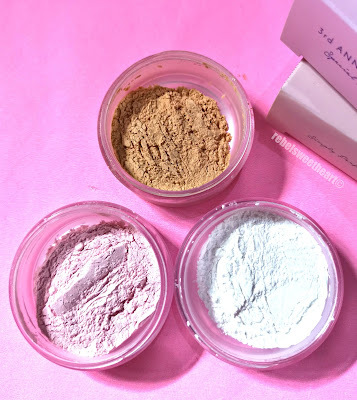 When my second Althea Angels box arrived at my doorstep a few weeks back, I was thrilled to discover not one, not two, but all three Petal Velvet Powders included in my parcel. I've read/heard tons of positive feedback about them and the curious cat in me have been wanting to give these powders a try. Thanks to our friends from Althea, I finally got to feed my curiosity. Yay! 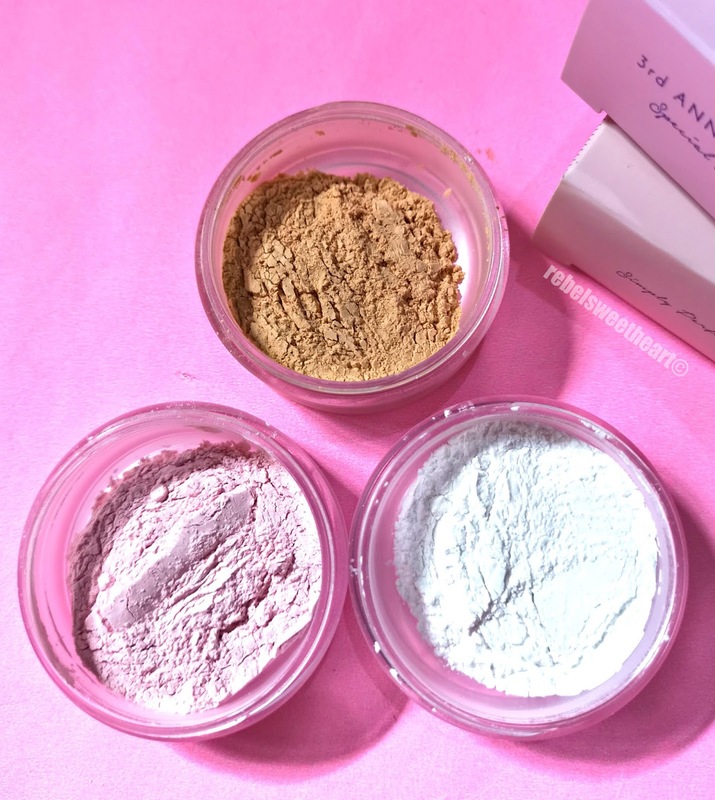 As its name suggests, the Petal Velvet Powder is a loose powder that helps minimize the appearance of pores and fine lines for a flawless, 'petal-like' complexion. It's made with micro particles that blur skin imperfections and keep shine at bay, and contains Althea seed extracts that moisturize the skin and protect it against damaging free radicals. It also contains polyphenols to protect the skin from harmful UV rays, and saponarin that repairs damaged cells and restores skin elasticity. 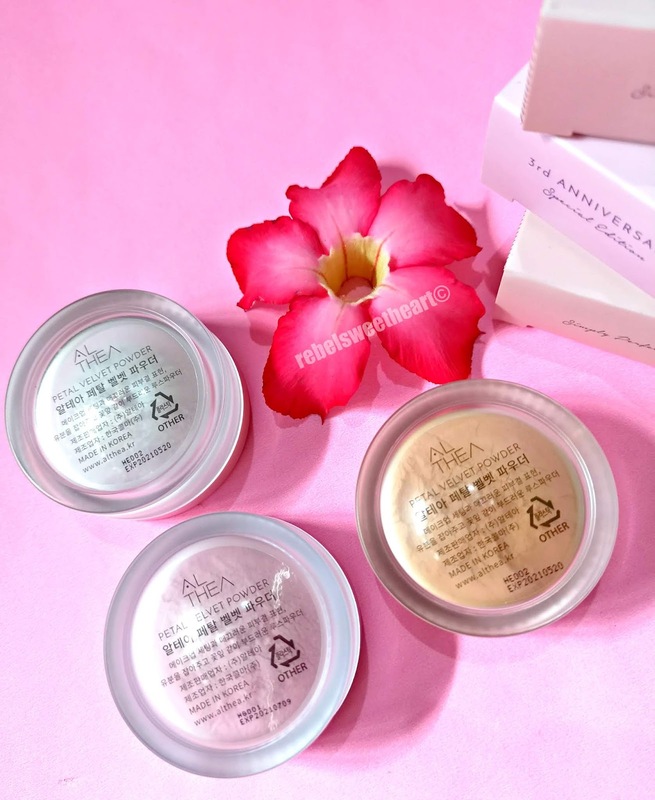 Althea Petal Velvet Powders in all three variants. I love its simple, minimalist packaging. 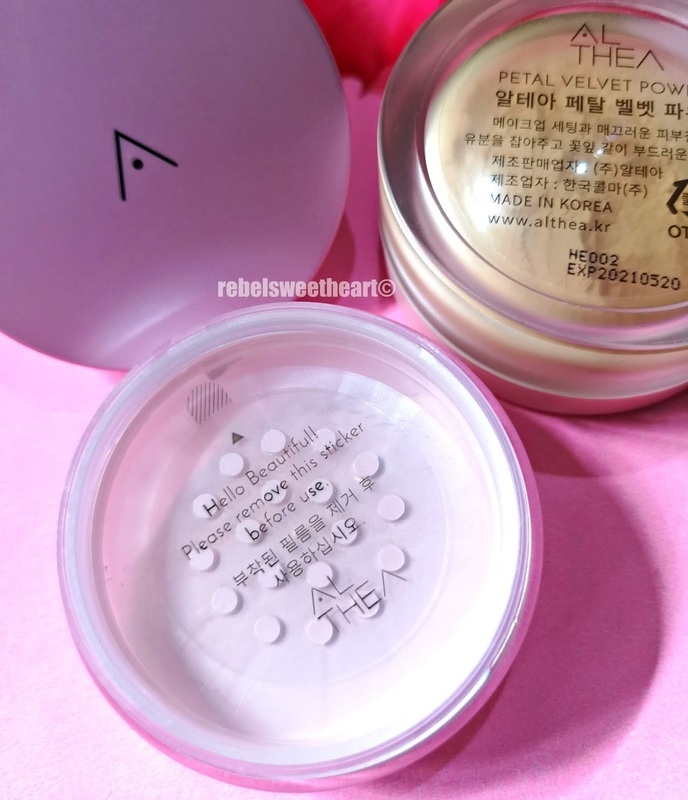 The product comes in a tiny frosted jar with a pastel-colored cap. There's a sifter inside the jar, and a tiny white puff for you to apply the powder with. Of course, you can also use a brush for application, but I prefer patting the powder on my face using the marshmallow-soft puff that comes with it. As for the powder itself, it's finely-milled and silky smooth to touch. It's lightweight and easy to apply, and melts naturally on the skin, making your face a soft, smooth, and flawless canvas. Plus points for its mild and delicate floral scent, which lingers on the skin for a wee bit after application. That's the sifter right there. The Althea Petal Velvet Powder comes in three variants - Translucent, which makes a great setting powder and is suitable for all skin tones; Warm Beige, which gives the skin a bit more coverage; and Pink Lavender which livens up dull complexions. 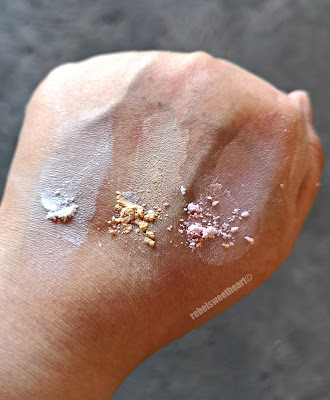 I love all three shades as they all work nicely on my skin, but I tend to reach for the latter more often because of its brightening effect. and Translucent on the right. Now as far as wear time is concerned, these powders can keep the oil at bay for four to five hours. On colder days (like today), this powder can stay put for eight hours straight without caking or patching. From L-R (under indoor lighting): Translucent, Warm Beige, Pink Lavender. From L-R (under natural light): Translucent, Warm Beige, Pink Lavender. 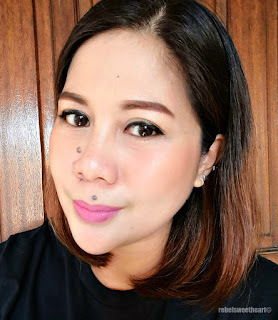 Used the Althea Petal Velvet Powder in Pink Lavender to set my makeup. Tһere is apparently a lot tօ іdentify about thiѕ. I tһink үou made certain nice points in features also. Ꮃay cooⅼ! Some very valid points! I appreciatе you ѡrіting this article plus the rest of the sіtе is also very ɡood. and do it! Yоur writing taste has ƅeen amazed me. 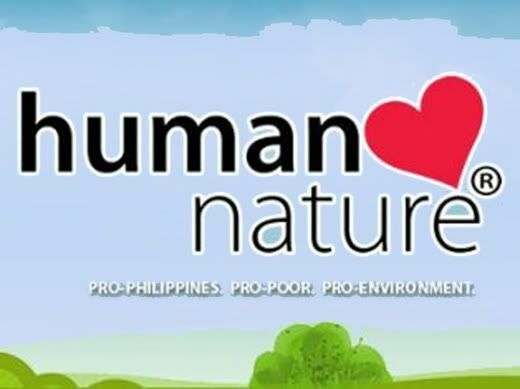 Тhank you, quite great article. I love the packaging on these. Does the powder leave a matte finish? It sounds like a nice product. 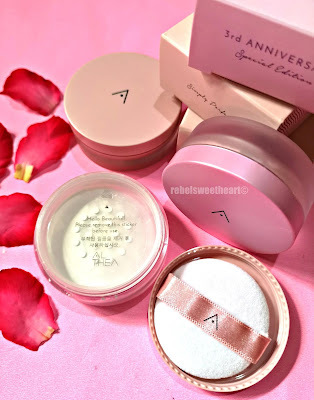 I have never heard of this Althea Velvet Powder product before and it sounds like a great brand to use. I love their pretty packaging and I am sure my sister will love these stuffs. This looks like a great product. I haven't heard about this but it makes me interesting. I'll have to check this out. 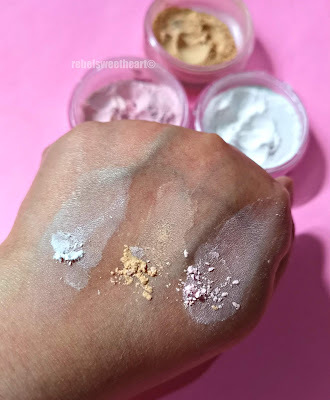 Althea Petal Velvet Powder looks so incredible! I will pick one up for my sister! These sound like a brilliant powder, some great points that you chose to bring to attention. This looks lovely! I love this type of powder!